229 Years ago the first ascent to the roof of Europe was achieved by Jacques Balmat and Michel Paccard. What has been, since then, a continuous mountaineering challenge is turning now into an engineer and architect competition to build the most attractive structure to attract higher number of tourists to high elevations and give them the thrill they miss in their day lives. New installations are being built on both side of the border and are portrayed by the media as a sort of competition between France and Italy (see the article on Liberation and la Stampa). France primacy, with the Aiguille du Midi, Alps’s most visited site attracting 500,000 visitors to Chamonix is seen as being challenged, as from May 30 the new Courmayeur’s Skyway featuring the Punta Helbronner terrace offering a 360 degree view of the French, Swiss and Italian Alps, has been opened to public traffic. It’s considered as he world’s most expensive cable car. 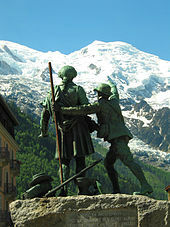 In previous articles Mountain Wilderness International already expressed its concerns about the tourist rush on Mont-Blanc slopes and the resulting over-crowding and safety aspects, it is also following through with the authorities on all sides of the mountain notably asking for more transparency on decision making processes affecting this environment. . While the old Courmayeur system was bringing 100,000 people a year to the Punta Helbronner, the new one expects to reach more than 300,000 (a voluntarily limited traffic number, but the installation has a far bigger capacity). During its two months or operation the Skyway has had already 50,000 visitors. Transportation in Italy to the top costs 45 Euros while it requires 57 on the French side. Connecting the 2 installations is also the “Vallée Blanche gondollas” installation whose capacity will remain unchanged even though a refurbishment is underway which is perceived by Mountain Wilderness as a wart in the environment. In order to stay competitive the Aiguille du Midi began a face-lift of its facilities surrounding the central peak by providing exciting new “products” targeting the upper class of international tourists, pushing comfort and expanding exciting services. This led to the creation of the “Step in the Void” and the design of the “Pipe”, a new walkway surrounding the central pillar of the Aiguille du Midi. It ‘s a 35 meters long tube built with a heavy, 87 tons of steel skeleton, encroached to the rock using 400 tons of cement. Not only it is designed to hold itself and tourists, but also to withstand the weight of 75 tons of ice and snow. 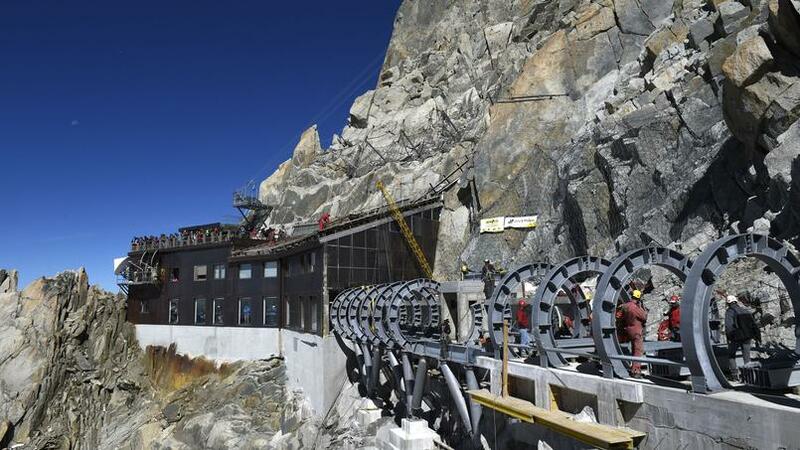 On Monday 3 August, a helicopter began transporting the pieces of this walkway to high altitude: 48 trips will be necessary to give life to this new attraction allowing tourists to do a full tour of the Aiguille du Midi pylon, at 3842 meters in the French side of Mont Blanc. The work is going on from April and continues with the installation of the huge pipe, with an expected completion by April 2016. 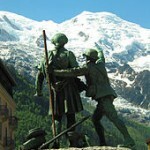 It required € 2.3 million investment by the Compagnie du Mont-Blanc (a private company). The excitement will only cost money…. but where is the spirit of the mountain gone?